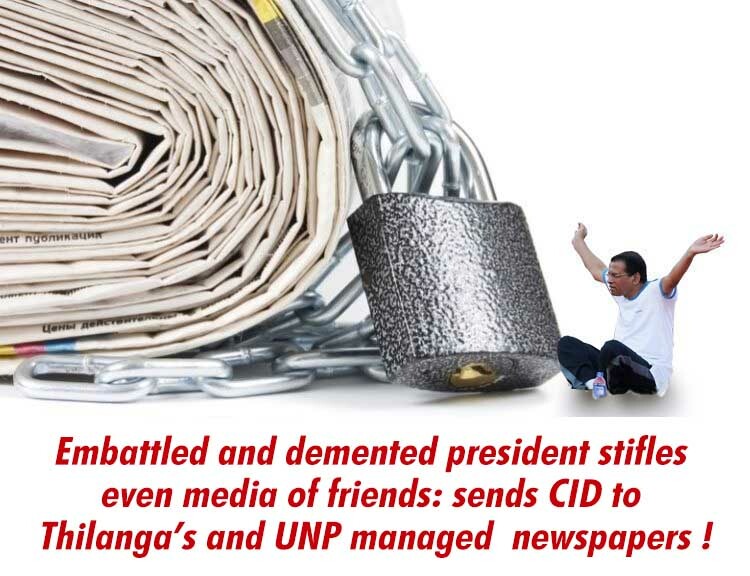 LEN - www.lankaenews.com | Embattled and demented president stifles even media of friends :sends CID to Thilanga’s and UNP managed newspapers ! 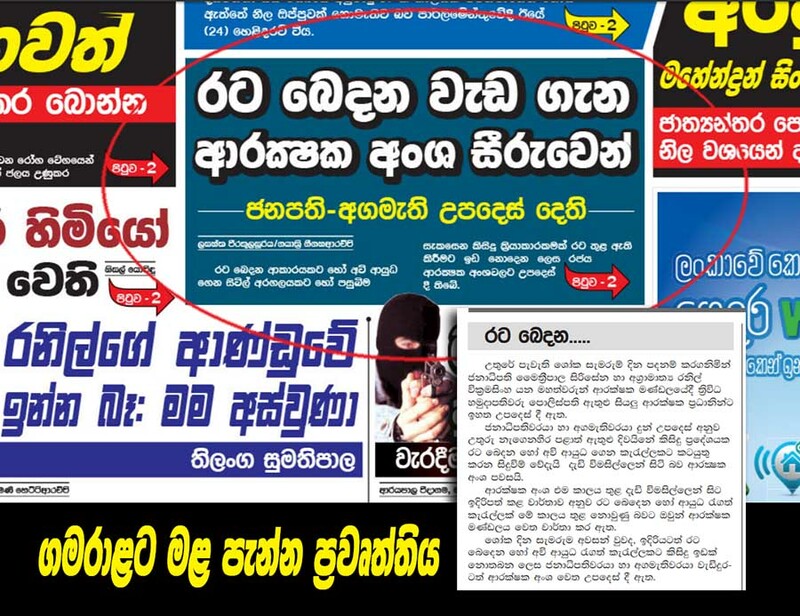 (Lank e News – 24.June.2018, 11.00PM) While the UNP which is the main constituent party is asleep at the wheel , President Pallewatte Gamarala on the other hand who started a vicious campaign against media freedom by unlawfully blocking the media which criticize him as well as proscribing and sealing such Institutions , has now extended that media suppression against his friends too, based on reports .Gamarala has now extended his media suppression to his bosom pal Thilanga Sumathipala’s daily newspaper ‘ Lakbima’ , as well as to Dinamina the government newspaper under the UNP administration . Dinamina and Lakbima on 2018-05-25 published reports regarding the celebration of heroes in May in the North and South. 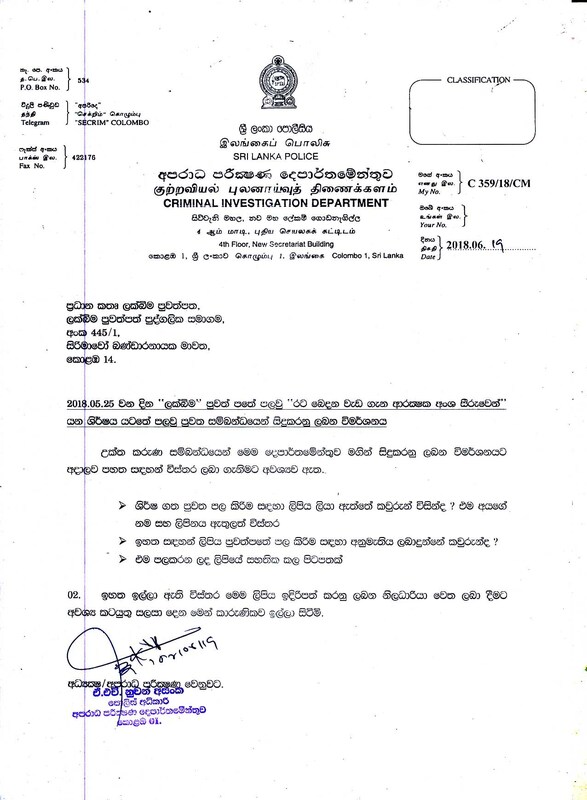 On the instructions of Gamarala an investigation was commenced by the CID into the news reports published. The news reports revealed the president and prime minister have at the security council meeting given instructions to be vigilant against activities in the North or South of an armed insurgency aimed at dividing the country. The president has taken offence because a security council matter was reported. . According to CID sources , as this was something published in relation to a matter discussed at the security council , it is being investigated . Yet in the letters sent by the CID to the two newspapers such a thing is not mentioned. In the letters under the signature of A.H.Nuwan Asanka S.P of the CID to the newspapers a number of bizarre questions have been asked. These reports have revealed a state secret nor are they detrimental to the country , and the names of the reporters in both Dinamina and Lakbima had been revealed along with the reports. In the circumstances searching for the private addresses of the journalists is unwarranted and unnecessary. It is anybody’s knowledge that when a report is being published it is done with the approval of the news editor and chief editor ,and probing into who provided the information is irrelevant. What is being searched without saying directly is , who is the participant in the security council who passed the information to the media. No journalist or editor is bound to reveal the source of information. In that case , the same CID aforementioned filed charges against the editor on the grounds that the latter did not reveal the source of information .The judge who heard the petition said , if such information is to be disclosed , it will not be possible to carry on the profession of journalism , therefore he confirmed there is a right to refrain from revealing such information. In the case the gazette notification No. 162 /SH dated 1981-10-14 which related to the laws was referred to. In any event , Gamarala’s attempt to obtain the addresses of the journalists is itself a clear threat to their security .Within the government itself there had been discussions, why the good governance president who came making loud announcements and promises that he would safeguard media freedom and ensure the security of the journalists , is questioning the media personnel who have not committed any offences. Meanwhile cabinet spokesman Rajitha Senaratne made an announcement on the 20 th. He said , there is information that there are 80 social media which are causing embarrassment to the government and spreading mendacious reports . Among them 40 are fomenting racial hatred while the other 40 are hostile to the government . It has come to light it is a new party that is behind these , and investigations have begun in that connection , he added. While the government taking stern decisions against spreading of falsehoods and racism is no issue , the grounds cited that ‘government is being harassed ‘ and ‘anti government’ are utterly bogus. This statement chanted by an authoritarian certainly is not in consonance with Rajith Senaratne . Besides a party operating a social media is not unlawful. If the president can grant rights to a ‘pet lackey’ of Kili Maharaja to run a plethora of social media , the new party too should have that right. 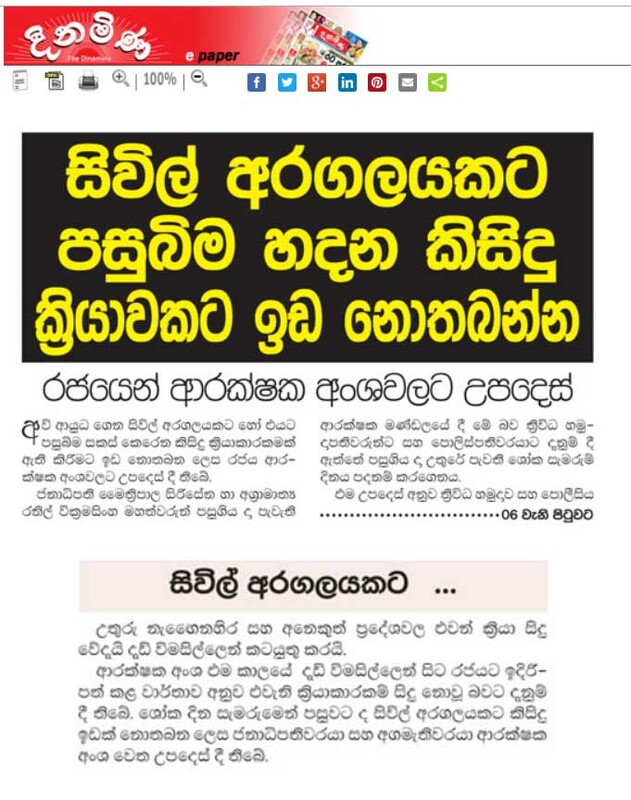 President Pallewatte Gamarala who is now precariously clinging on to a 4 % popularity base is now determined to stifle and suppress the media which are justifiably castigating him , as a last straw nursing the hope to field as a presidential candidate at the next elections. It is a universally accepted fact, for any foolish ruler when he is in his death throe to seek temporary relief by suppressing the media .If Gamarala is choosing only that avenue and no other, let us forewarn , at least the social media of Libya allowed Gadaffi to hide in the culvert finally , but in the case of Gamarala , the social media of SL will not spare even a culvert for him to hide. (The relevant media reports and the letters sent by the CID to Lakbima and Dinamina are in the photographs herein).